We’re not sure where GSMArena managed to get a Samsung ATIV S, especially with no obvious handlers interfering, but they did and they have a nice 3-minute video tour of the phone. The video has some excellent production with ample light, allowing us to finally see the long missing Samsung Windows Phone. The video also highlights what should be obvious: that 4.8” Super AMOLED display with Gorilla Glass 2 is quite massive and not in a bad way. The device is clearly super thin (by comparison to other Windows Phones) but just a monster in terms of how big the view is on it. For some users, that’s clearly a selling point and we could only imagine how nice it must be type on such an ample on-screen keyboard. Tiny Elvis says: "Man check out the size of those Tiles...man that sucker is huge"
The rest of the device is quite standard from what we’ve previously seen with a heavy focus on plastic for the body, but we don’t think that deters from the device in any way. But clearly some of you have strong opinions on that (versus the more robust polycarbonate shell). Windows Phone 8 also gets demonstrated a bit in the video though we can’t say any new features leap out. We’re not aware of what build of the OS it is running, though it is presumably either final or close to it. One thing is for certain, that OS hauls pretty well when being pushed by that dual-core 1.5GHz Snapdragon S4 CPU and with that huge 2300 mAh battery on board, we’re sure the ATIV S will do quite well in the power department. Unfortunately, Samsung has yet to either secure or announce any US partner carriers for the ATIV S. We’re not sure what Samsung’s strategy is exactly for Windows Phone 8, but so far it seems as if they just don’t have one. (In case you’re wondering, Samsung has never once reached out to this site regarding this phone and has so far shown very little interest in the Windows Phone community). Recently in a Windows Phone Central reader poll, only 5% of you were seriously considering the ATIV S over other Windows Phone 8 devices. Part of that is due to the lack of carrier information but a lot of it has to do with perception of the company. 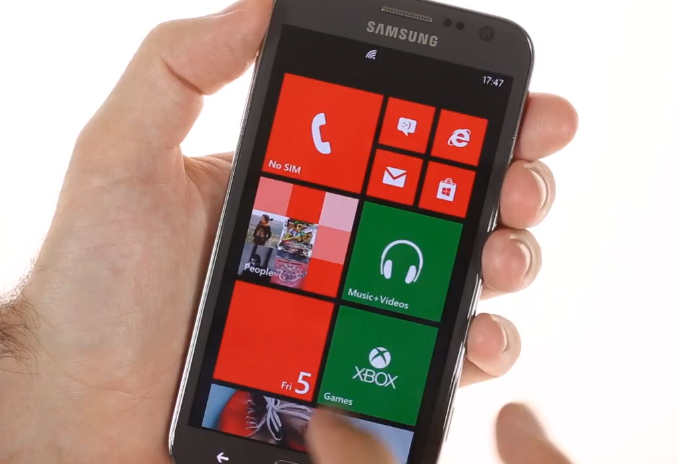 That’s a shame as this video clearly shows the ATIV S, while not for everyone, is a sharp looking phone. Related: See our Windows Phone 8 comparison guide.